Construction work was going on Monday at the intersection of Second Avenue and Ellsworth Street. Since June, the construction company Emery & Sons has been digging up and rebuilding sidewalks and underground utilities in a project that covers about 26 blocks on seven streets. Mainly affected are the downtown segments of Second and Third Avenues and Ellsowrth and Lyon streets, plus single blocks on Broadalbin, Ferry and Calapooia streets. I asked for an update on the project, which the city at first said — and still says on its website — should be done by December. But as project manager Lindsey Austin reminded me, officials told the Central Albany Revitalization Area board as early as June that the final repaving of the downtown streets would be pushed into spring and summer of 2018. 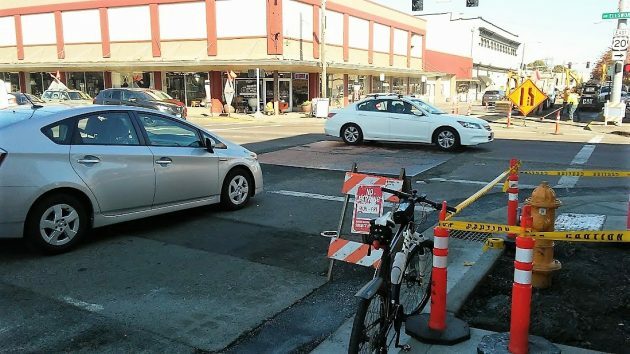 Also in 2018, ODOT plans to put a pavement overlay on Ellsworth and Lyon. Austin gave me a summary of the work so far: Sidewalks have been rebuilt on five of 11 blocks in the project area. This includes openings for tree wells and bases for light poles. Almost all of the stormwater infrastructure is completed. Electrical conduit has been installed almost everywhere, with only half of Lyon and Ellsworth left to do. Installation of curb ramps on Lyon and Ellsworth is under way. New water mains are complete on nine of the 13 blocks where they were scheduled. Is the project more or less on schedule? I have been thinking for a long time, as the projects on Crocker Lane and in downtown Albany progress so slowly, that just maybe the construction contract was not written properly. Not to put people on the defensive, but that is my opinion. The project on crocker is required to be done by november or else the contractor will be fined per day. I really don’t see them getting done before then. The whole project has been a mess. in town. I’m talking about roads! So will all this mess be gone by the Vets Day parade? ?